We’d love your help. Let us know what’s wrong with this preview of Understanding Girls with ADHD, How They Feel and Why They Do What They Do by Kathleen G. Nadeau. To ask other readers questions about Understanding Girls with ADHD, How They Feel and Why They Do What They Do, please sign up. This is a comprehensive overview of the issues that face girls with AD/HD, and the importance of addressing them as early as possible. The authors discuss how to recognize AD/HD in girls (for example, the "H" doesn't look like stereotypical hyperactivity), the unique risks of AD/HD in developing girls, and how to address the condition. I, particularly, found the sections on socialization helpful: my daughter has ADD, and for the most part I have always understood her behaviour quite well, even b This is a comprehensive overview of the issues that face girls with AD/HD, and the importance of addressing them as early as possible. The authors discuss how to recognize AD/HD in girls (for example, the "H" doesn't look like stereotypical hyperactivity), the unique risks of AD/HD in developing girls, and how to address the condition. I, particularly, found the sections on socialization helpful: my daughter has ADD, and for the most part I have always understood her behaviour quite well, even before the diagnosis. But I never understood why she didn't have close friends, and why playdates always ended badly. The descriptions of failed social interactions in the book helped. Lots of interesting food for thought in here, which is new to me but probably not to someone who has been grappling with the topic for a while. ADD is particularly difficult in girls because it exaggerates behaviours which are considered masculine: risk-taking, aggression, physicality. The multiple demands of femininity — being tidy, pretty, together, contained, considerate of others — are difficult enough for neurotypical women but really play to the weaknesses of girls with ADD. I feel like I have a lot more reading and thinking to do on this topic, and that my understanding of feminism will be the stronger for it. I diverge from the authors on two points: First, I'm not yet convinced that ADD is a disorder; I think it's quite possibly a normal neurological variation that is evolutionarily advantageous at the group and possibly individual level. I haven't done a lot of reading on that, yet, though. Second, the authors recommend "behaviour modification" — punishment and rewards — to alter a child's behaviour. My new understanding of ADD hasn't affected my belief that positive, democratic parenting is the way to go — my child is not a rat in a Skinner box, no matter how many disorders she has. Secondary to that, it's also a fascinating exploration of how sexism intersects with research practice and medical care. This is the first book published dealing with ADHD in women only. I underlined so much in this book. It explains so much to me: about my childhood, my daughters, and how to address their future years as teenagers and young adults. I especially love that it's broken down into different life stages and explains how a girl is affected by her ADD at each point in her development. This makes so much more sense than other books who just lump all the symptoms and characteristics together. Boken gav mig större förståelse för min adhd utifrån ett könsperspektiv som jag tycker är oerhört viktigt. Denna hjälpa mig verkligen att få in perspektivet "flickor" /kvinnor i min egen diagnos. Tidigare hade jag endast läst om diagnosen ur ett manligt perspektiv. Denna gav mig svar på varför det har varit som det har varit under min uppväxt och den ger även forskningsstöd i varför flickor hamnar utanför radarna och varför flickor kan uppleva adhd på ett annat sätt en som bara hyperaktivt. 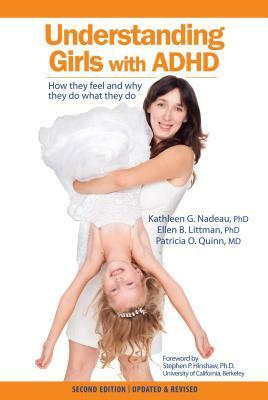 This is a very readable and comprehensive book, focusing on recognizing and handling ADHD in girls. I would recommend it highly for parents of girls with ADHD and all teachers. Opened my eyes and provided so many details on what my girl has been dealing with. Provided me with a little comfort to know that I wasn't alone. Nearly all the books I’ve read about ADHD skews heavily towards males. Everyone is familiar with the stereotype of the energetic little boy, jumping out of his seat in school, and throwing tantrums in the restaurant. However, This review originally appeared on my blog at www.gimmethatbook.com. I'd like to think that I am somewhat knowledgeable--maybe even a quasi-expert--at girls with AD/HD. After all, I am a mother of such a daughter (now 10 years old) and in my "previous life," worked in child and adolescent psychiatry where I saw, first-hand, many of the manifestations of AD/HD. Never before, though had I come across a book outlining with such sympathy--not to mention, honesty--the ins and outs of raising a daughter with such a condition. Nadeau, Quinn, and Littman, *true* experts I'd like to think that I am somewhat knowledgeable--maybe even a quasi-expert--at girls with AD/HD. After all, I am a mother of such a daughter (now 10 years old) and in my "previous life," worked in child and adolescent psychiatry where I saw, first-hand, many of the manifestations of AD/HD. Never before, though had I come across a book outlining with such sympathy--not to mention, honesty--the ins and outs of raising a daughter with such a condition. Nadeau, Quinn, and Littman, *true* experts in their field, shed valuable and insightful light on a condition once reserved strictly to boys--and even though we knew on some level that girls also suffered from the ill effects of hyperactivity, distractibility, and inattention characteristic of AD/HD, this edition brings forth a whole new set of data. We we know now that girls do in fact suffer from this disorder, we didn't always have a name for it. In the past, girls were considered "tomboys," or "dreamers." We've known for some time--this isn't exactly news. What I liked about UNDERSTANDING GIRLS WITH AD/HD: HOW THEY FEEL & WHY THEY DO WHAT THEY Do is the blending of research in a family-focused manner, making it accessible to just about anyone who wants to make life with their AD/HD girl better. Plus, the information on coexisting conditions (mood disorders, executive functioning, eating disorders, and other at-risk behavior) is gold. The book is structured in such a way that you could read portions based on how you want to use the information. For a parent just starting on the AD/HD journey, it's a great intro. You can stop there, or continue reading for "curves up ahead." The preschool years, elementary, all the way through high school and entering young adulthood are covered, along with tips, check-lists, and screening tools. This is definitely a guide to hang on to and refer as your daughter grows, and may well be highly valued among pediatricians, RNs, and psychologists--it's just that good. UNDERSTANDING GIRLS WITH AD/HD is a practical, solution-focused advice that will stay with you for years. This is a good place to start for any parent or teacher who has/works with girls who may have or have been diagnosed with ADHD or ADD. Lots of brain science, but also lots of practical and useful tips. It amazes me how many of our girls go undiagnosed and develop low self-esteem and other harmful ideations that can lead to self-destructive behaviors later in life. Very matter of fact, but also very hopeful for those of us who want to help our girls reach their full potential. I wept with relief and grief for my own experiences. I wept with gratitude that I found this book before ADHD had a chance to undermine my daughter's spirit and self-worth. This book is filled with many a-ha moments and helpful strategies. It should be a must-read for anyone dealing with ADHD, either personally or as the parent/teacher of a girl with ADHD. This book will change the course of my daughter's life. For anyone who has even the remotest hint that a female for whom s/he cares might have AD/HD, this is an extremely informative resource. It clearly describes AD/HD's seemingly opposite manifestations in very young girls, preschoolers, school children, teens, highschoolers, and adults. And it includes helpful advice for parents as well as educators who wish to help a girl use and appreciate her strengths and build self-esteem. This is an excellent resource. This book clearly explains ADHD (ADD) and the unique impact it has on young females. It is filled with empowering recommendations for girls and families to take practical action towards fighting the executive-function deficits. An honest and practical text that will help you attack ADHD with ammunition and hope. This book helped me enourmously when I got diagnosed as an adult. It is still my "go to" text, I recommend it to everyone and sometimes I even pull it from the shelf and read aloud to my boyfriend or others to explain things or make them understand my sometimes weird behaviour. It is a really thorough book, brings insight and for me personally acceptance. Dr. Quinn is a lifesaver, especially on the days I have answered the same question 14 times and am getting a little, shall we say, frustrated. I saw her give a seminar last week at UNC and she was amazing -- over 700 people attended so I think word is getting around about her and ADHD. The only reason I didn't like this book was that I was too old for it and much of the advice was too late. This was the best book I've read on ADHD, specifically because it is about girls. Girls' issues are different from boys' and this book clearly outlines those differences. Very helpful! All teachers should read this! I was hoping for more examples of ways to scaffold learning for girls w/ ADHD. Perhaps the majority of girls with AD/HD fall into the primarily inattentive type, and are most likely to go undiagnosed. Generally, these girls are more compliant than disruptive and get by rather passively in the academic arena. They may be hypoactive or lethargic. In the extreme, they may even seem narcoleptic. Because they do not appear to stray from cultural norms, they will rarely come to the attention of their teacher. Early report cards of an inattentive type girl may read, "She is such a sweet little girl. She must try harder to speak up in class." She is often a shy daydreamer who avoids drawing attention to herself. Fearful of expressing herself in class, she is concerned that she will be ridiculed or wrong. She often feels awkward, and may nervously twirl the ends of her hair. Her preferred seating position is in the rear of the classroom. She may appear to be listening to the teacher, even when she has drifted off and her thoughts are far away. These girls avoid challenges, are easily discouraged, and tend to give up quickly. Their lack of confidence in themselves is reflected in their failure excuses, such as, "I can't," "It's too hard," or "I used to know it, but I can't remember it now." is. These girls are reluctant to volunteer for a project orjoin a group of peers at recess. They worry that other children will humiliate them if they make a mistake, which they are sure they will. Indeed, one of their greatest fears is being called on in class; they may stare down at their book to avoid eye contact with the teacher, hoping that the teacher will forget they exist for the moment. Because interactions with the teacher are often anxiety-ridden, these girls may have trouble expressing themselves, even when they know the answer. Sometimes, it is concluded that they have problems with central auditory processing or expressive language skills. More likely, their anxiety interferes with their concentration, temporarily reducing their capacity to both speak and listen. Generally, these girls don't experience this problem around family or close friends, where they are more relaxed. Inattentive type girls with a high IQ and no learning disabilities will be diagnosed with AD/HD very late, if ever. These bright girls have the ability and the resources to compensate for their cognitive challenges, but it's a mixed blessing. Their psychological distress is internalized, making it less obvious, but no less damaging. Some of these girls will go unnoticed until college or beyond, and many are never diagnosed they are left to live with chronic stress that may develop into anxiety and depression as their exhausting, hidden efforts to succeed take their toll.